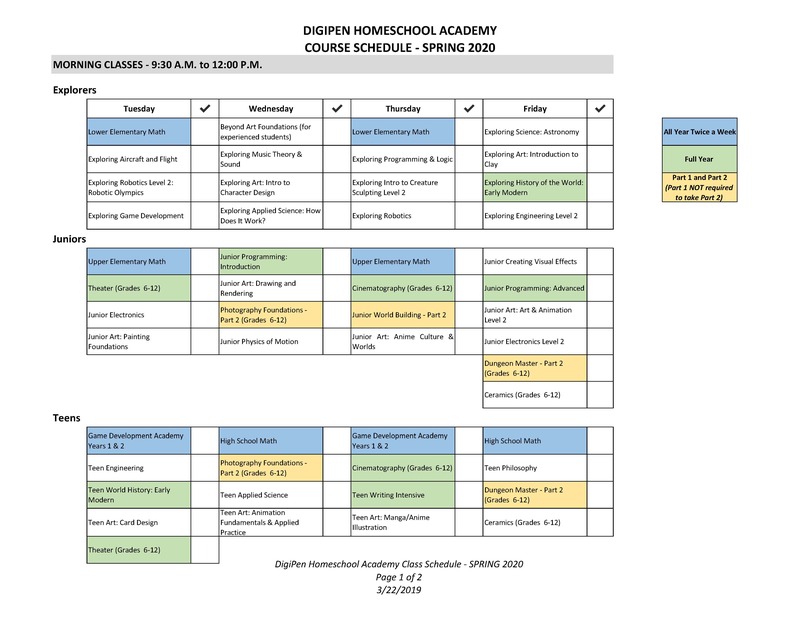 Enhance and complement your homeschool curriculum with a selection of engaging courses or a complete year-round academic program. Visit our new Registration Portal. Please note that a non-refundable deposit of 25% of tuition is due upon registration, along with all non-refundable materials fees, to hold your seat. Don’t forget that April 30, 2019 is the deadline for the EARLY BIRD DISCOUNT! We still have room in our May Programs. Register Here! 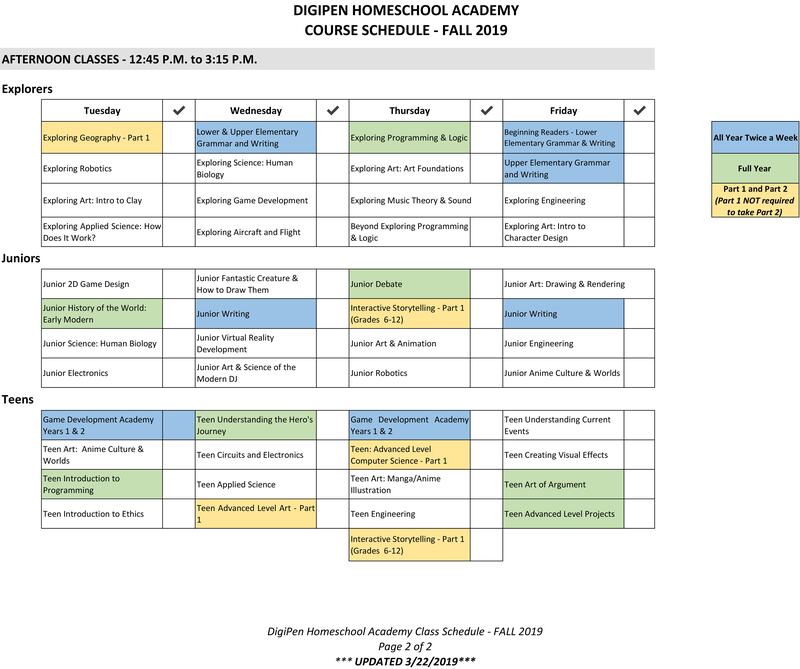 Monday, Tuesday, Thursday and Friday during the entire school year, DigiPen Academy prepares K-12 students to succeed in the college and professional paths they choose to pursue. 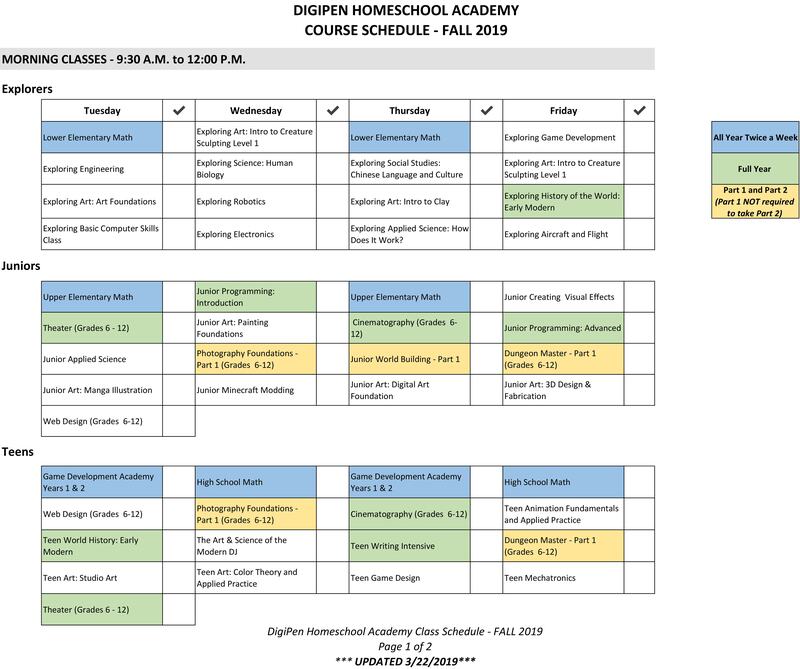 Taught at a facility across the street from DigiPen’s main campus, the learning experience can be described as a cross between a traditional homeschool co-op and a comprehensive school. In addition to offering core general educational courses in math, reading, writing, and science, DigiPen Homeschool Academy offers a wide variety of elective courses in video game programming, art and animation, game design, engineering, and music and sound. Let us help enroll your student in the right courses. We celebrate the individuality of our students. Using traditional grade ranges as guidelines, we strive to place students in classes according to their current knowledge and skill levels. Our coordinators can help you place your student in the appropriate class. If a course has prerequisites, DigiPen will assess your child’s knowledge and ability in order to recommend the best placement. Families may choose to take as few or as many courses as needed to meet their student’s learning goals. Taught using extended 2.5 hour blocks, teachers have adequate time to present the course concepts while allowing for meaningful time for students to work on exercises and projects. This approach provides the teacher with direct evidence of a given student’s understanding and competency, which in turn allows the teacher to truly meet students where they are. 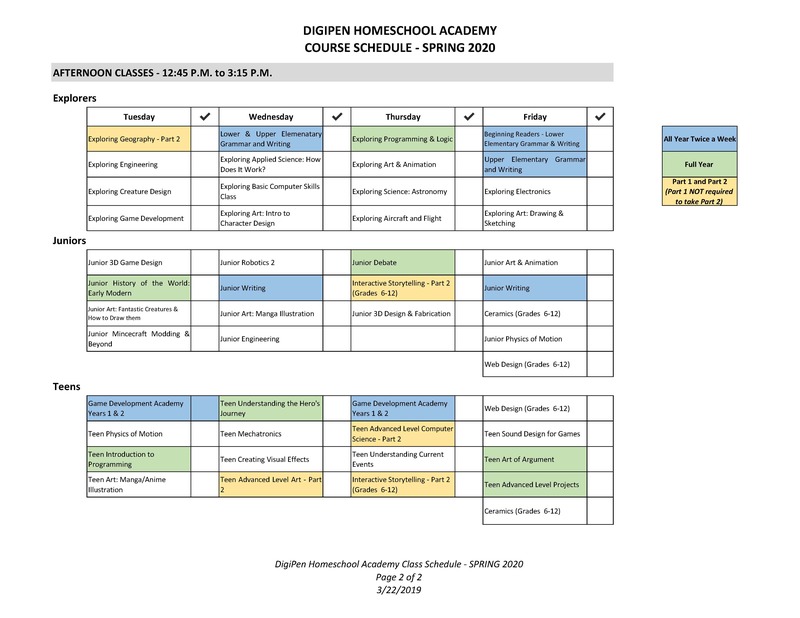 May Programs are full courses offered on Tuesdays and Thursdays during the month of May. Each course offers 40 hours of dedicated class time that includes individualized project based learning. Why Take a May Program? Classes meet Tuesdays and Thursdays 9:30 A.M. – 3:15 P.M. 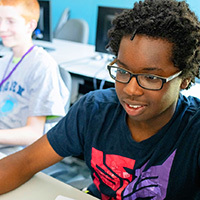 In addition to offering core general educational courses in math, reading, writing, and science, the Explorers Homeschool Program offers a wide variety of elective courses that allow students to explore their interests in technology and develop fundamental skills in video game programming, game design, art and animation, engineering, and sound design. 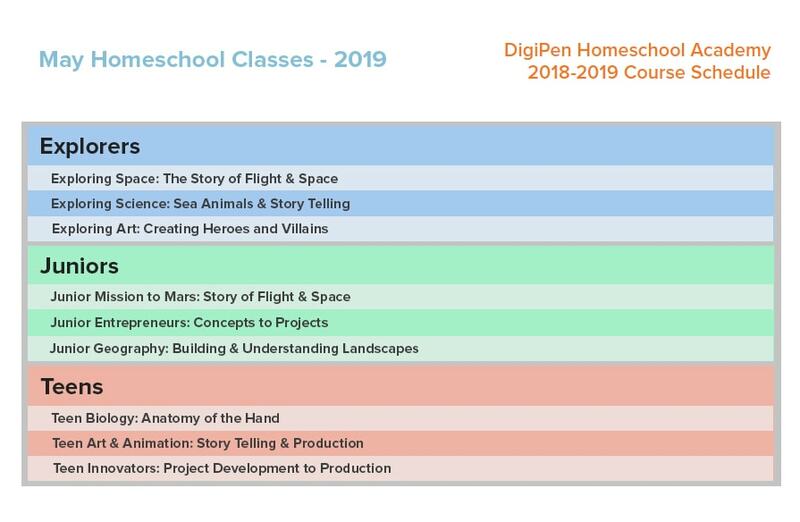 DigiPen’s Junior Homeschool Program offers general education as well as courses that introduce students to topics in video game programming, game design, art and animation, engineering, and music and sound design. These courses are great for students in Grades 4–7, who want to move on to more advanced technology courses when they are older. As students enter their high school years and the focus begins to shift toward preparation for college, DigiPen Academy courses are right there with them, delivering the level of academic instruction and technical experience they need to thrive. Whether they’re working an general education classes, or already starting to focus on specialty subjects like programming, games, art, engineering, or music, we’re here to inspire. 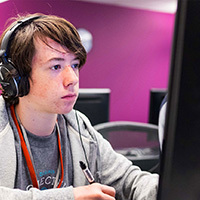 The two year Game Development Academy is a multidisciplinary intensive study of creating games. 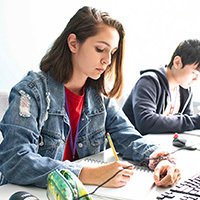 The program incorporates instruction in game design and theory, computer science and programming, art and animation, and sound and music. Each year of the Game Development Academy is independent for registration, but intended as a continuous experience. First year students will create several introductory projects as they learn the fundamental skills of game development. Then they will join into teams to culminate their year in a group game project. Second year students will be given more challenging and holistic individual and team projects, including creating development tools, promotional marketing, and installation media. Need to know about tuition, pickup or withdrawal policies?